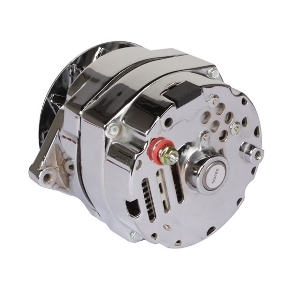 These older style alternators can be referred to as a 2-wire, 3-wire, or even 4-wire. Regardless of the name, the important difference is that they are designed to work with an external regulator. They were used after generators were phased out from the mid 60’s until about 1972. They can be identified by two vertical terminals where the connector plugs in. A 3-wire or “OEM-style” alternator will also be internally regulated and have a charge post and two terminals on the side (viewed from back). 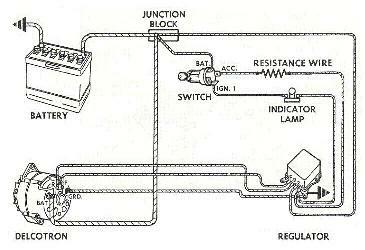 Typically the left terminal is for the field or exciter circuit and the right terminal is used for the sensing circuit. They are slightly more complicated to wire up, but have the advantage of charging at lower rpm and the ability to use an original warning light. 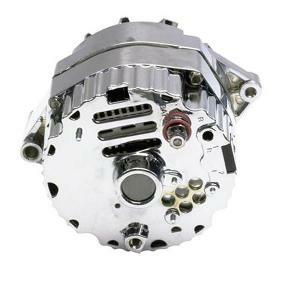 A 1-wire alternator offers a simplified installation and clean setup. It has one wire that connects the charge terminal directly to the battery or a 12V source. They are internally regulated and grounded through the block. 1-wire alternators will not have a way to hook up a warning light, but most custom applications work well with a voltage gauge in its place. The cut in speed (the speed at which the regulator begins to charge) will be slightly higher (1200rpm or higher) than most alternators which means they do not charge at idle. One exception to this is Tuff Stuff's 140amp performance 1-wire alternator, rated to charge 80amps at 750rpm.